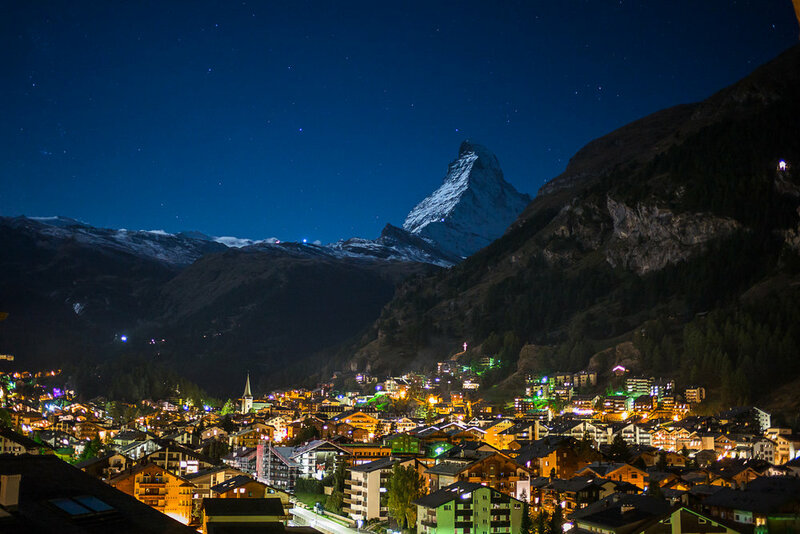 Zermatt is a quaint village and home to the Matterhorn! In order to arrive at this bijoux, you take a train for 4 hours from Geneva or Zurich, or drive several hours and park your car at Täsch (village close by) and then take the train. Some people ski over from Italy, taking the Cervina lift (the backside of the Matterhorn). The wealthy drop in by heli like Dicky Roper in The Night Manager. If you travel by train, the final leg is on the Matterhorn Gottardbahn train from Visp. A special cogged rail train has a cogged rail is needed to climb the steep mountain canyon. Look out the windows at glaciers and cliffs as the train continues to the mile high village of Zermatt. The ride from Visp is about an hour but will seem like minutes because of the gorgeous scenery. Upon arrival, you are a few steps from the main street or Bahnhofstrasse. Inside the village most people walk, ride a bike or hop on a bus. There are no cars other than occasional mini electric vehicles that serve as taxis and delivery trucks. The mountain air is pristine and the narrow streets safe for pedestrians. People visit from all over the world and yet, the village maintains it's charm. The village of Zermatt hosts the highest European ski resort with 365 days of skiing in two countries. The Matterhorn is so famous Toblerone* created a special chocolate bar. The Toblerone is so beloved that changing the shape and packaging caused an outrage! Zermatt is surrounded by imposing mountains on all sides. The streets have little shops and restaurants with inspiring views. 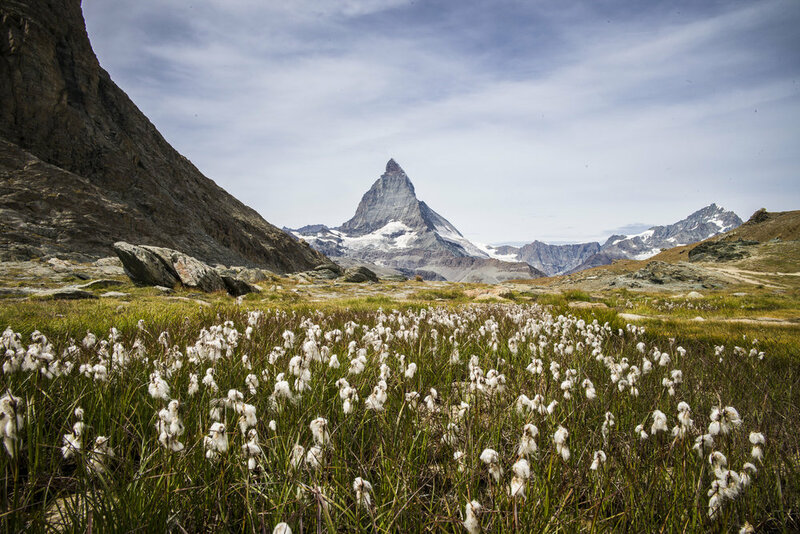 Zermatt offers something for everyone, especially outdoor enthusiasts and photographers. There are hundreds of miles of trails through the mountains you can access right from town. Enjoying food and drink at the Taste Village. Zermatt Unplugged is a unique acoustic music festival that takes over the town with multiple music stages as well as on mountain top venues. There are 4 main stages as well as pop up venues. In addition there is the “Taste Village” in town which hosts a mix of outdoor/indoor dining choices with a wide range of culinary delights. Grill sausages over an open flame, sample sushi, cocktails, risotto, charcuterie or pizza. Since 2007 the festival commences in April for 5 days. We attended Zermatt Unplugged in 2017 and look forward to returning in 2018. One highlight is the trek to "Extreme Jazz” at the Gandegghütte Cabin. This open air mountain top venue is unique with ice tables to accomodate your food and drink while you rock out to London's Ronnie Scott's All Stars. To get there you take a tram and then hike on a snow covered trail for about a mile. The hike is next to a ski run under the Matterhorn and Monte Rosa, so you can enjoy the skiers taking a few turns. As you crest the ridge and look down on the bright yellow Gandegghütte, you will be amazed to see the colorful crowd of music lovers. Tip - Get there an hour before the show starts to get a good seat. At the Gandegghütte a snow stage was built for the band (the grand piano delivered by heli!) and a bar serves food and drinks. At 3,030 metres above sea level, the Gandegghütte cabin is the highest venue of the festival. Built in 1885, the building represents genuine Swiss mountain cabin culture and lies beneath the Matterhorn Glacier Paradise ski area, offers a view of the Klein Matterhorn and the imposing east face of the Matterhorn. Musical artists include European as well as American headliners, indie acts and classical musicians. The venues are intimate and attendees are ready to party! Each night at 9pm DJ Cup of Jazz gets the party started at the unique Heinz Julen shop with dancing late into the night. The Hörnlihütte (or Hornli Hut) serves as the Matterhorn base camp. The first ascent of the Matterhorn was in 1865. The Hörnlihutte was built 15 years later and has provided hospitality and shelter to climbers and hikers for 130 years. The hut services the climbers that wish to summit the Matterhorn as well as hikers that simply want a day hike of adventure. It usually opens in late April. To reach the Hörnlihütte take the gondola to Schwarzsee then begin your hike. Don't worry, you will get plenty of exercise. From Schwarzsee the hike is a strenuous 3 miles. It took us about 2.5 hours including stops for rest and photos. In those 3 miles you climb about 2300 ft. The air is thin as Schwarzsee is at 8372 ft (2552 m). Be prepared with appropriate gear for ice and snow along the route. There is an open deck at the Hörnlihütte and at 10,695 ft (3260 m), you are in some rarified mountain air. Enjoy food, drink, an amazing view as well as groups of very fit hikers either finalizing their plans or celebrating their descent. Order Rösti for lunch and relish the scene. If you wish to take the gondola back to town, you need to pay attention to time because it closes in the afternoon. We had to hustle with only 15 minutes to spare before the last gondola car departed. If you miss the gondola, you will hike down to the village which adds another 5 miles and 3100 ft of elevation descent. Bring a headlamp if you hike after sunset. Here is a good description of the hike with maps and resources. Splurge on the Gornergrat Bahn. This cogged narrow gauge railway starts in Zermatt and climbs to 3100 meters and arrives at the Kulm Hotel. There are also hiking trails to enjoy the breathtaking views of Monte Rosa and the glaciers. Splurge more and spend an unforgettable night at the Kulm. Reservations are required and included is a charming Swiss mountain dinner along with a hearty hiker's breakfast. During the day many people visit but when the last train leaves there are only a handful of overnight guests. If you spend the night at the Kulm, the sunrise is beyond words (weather permitting). The red rays of the morning sun illuminate the Matterhorn. Enjoy the Matterhorn close up and in the privacy of your room with warm coffee. A clear night sky is conducive to stargazing or astrophotography. There are even a couple observatories on the roof. The Kulm sponsors special astronomical events so check their schedule if this interests you. Spending the night at the Kulm is a unique experience. Tip - If high altitudes are a concern, an overnight stay may not be for you. Zermatt is home to every kind of cuisine. Here are a couple favorites. Both are outside of town so the journey is part of the experience. You earn your meal by hiking, skiing, or biking. Along the way all of your senses are activated. Incredible food compliments the incredible view from Chez Vrony! Chez Vrony is bucket list worthy! The view of the Matterhorn will give you palpitations, the food is ambrosial and the ambiance is other worldly. Plan to make a day trip out of getting there and back and customize to suit your energy level You can hike, bike or ski to/from Chez Vrony or take the Sunegga funicular in town to The Sunnegga-Rothorn valley station and walk 10 minutes to the restaurant. The restaurant serves organic home produce from livestock raised solely on alpine grass. Edelweiss sits on a rock ledge opposite the village. At night the lights of Edleweiss are clearly visible from anywhere in the village. It is possible to spend the night at Edelweiss or hike up for lunch or snack. If the weather is clear, relax on the deck and enjoy a commanding view of Zermatt. There is also a quaint dining room inside. The hike up is strenuous and takes about an hour. Return on the same trail or take the long way back by zigging and zagging down alternate trails. The loop route takes you through sheep pastures while the Matterhorn looms silently above. The whole experience is typical......."Swiss." Zermatt Apartment Rentals is our top choice. Hosts, Lesley and Stuart, represent apartments and chalets with Matterhorn views and ski in/ski out option. Hosteling International offers no frills lodging. Le Mazot Restaurant provides a couple lodging options. We love the restaurant but haven't stayed overnight with them yet. They offer an affordable room with private bath or bargain shared climber's rooms with shared bath down the hall. We hope you enjoy the photos below. If you wish to see some more, please visit our gallery. The Matterhorn at night with clouds and stars in the sky. The lights of the climbers are showing the way to the summit. The lights of the Kulm hotel at the top of the Gornergrat railway. The Matterhorn in the background. The rising sun lights the peak of the Matterhorn with the Kulm hotel in the foreground. 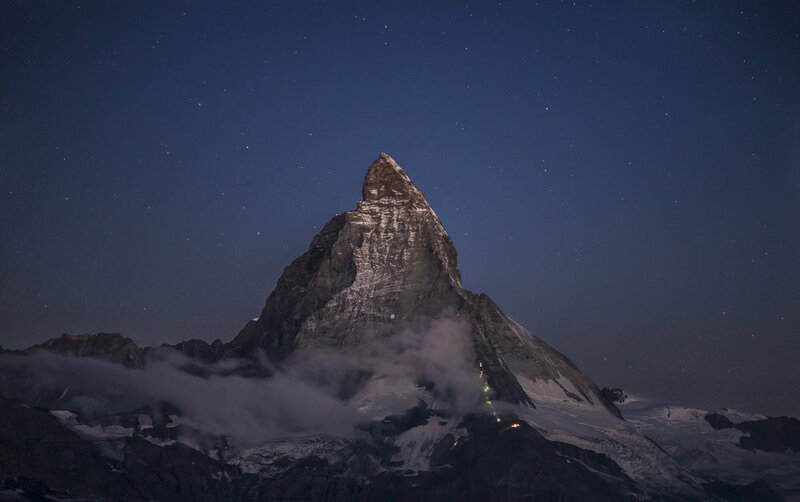 The Matterhorn at night is lit by the full moon. Taken from the village of Zermatt. The Matterhorn is visible through the clouds. This is the trail to the Hornli Hut, the base camp for the Matterhorn at 3260 meters. 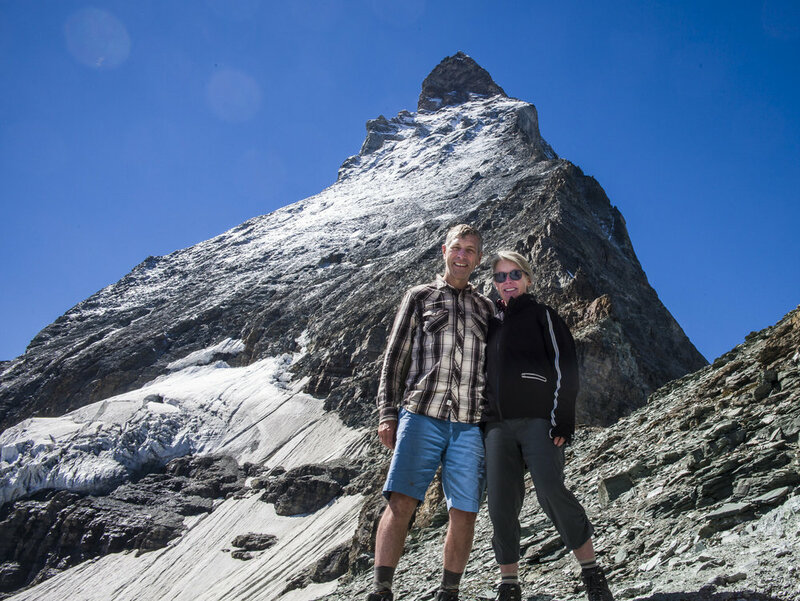 Rick and Cheryl at the base camp for the Matterhorn. Taken form the Hornli Hut at 3260 meters. Cheryl is hiking past the Matterhorn through the snow to visit the Gangegghut for an outdoor concert at Zermatt Unplugged.